This development demonstrates the level of interest and confidence within F1 in the mechanical KERS system based upon Torotrak’s full-toroidal traction drive technology. Furthermore, it highlights the benefits of using Torotrak’s technology to meet the requirement outlined by FIA president Max Moseley – of developing technology directly relevant to improving fuel efficiency in road cars – by recovering energy from the vehicle under braking and subsequently re-using that energy to accelerate and drive the vehicle. The mechanical KERS system utilises flywheel technology developed by Flybrid Systems to recover and store a moving vehicle’s kinetic energy which is otherwise wasted when the vehicle is decelerated. The energy is received from the driveline through the Torotrak CVT, engineered and supplied by Xtrac, as the vehicle decelerates, and is subsequently released back into the driveline, again through the CVT, as the vehicle accelerates. The FIA has defined the amount of energy recovery for the 2009 season as 400kJ per lap giving the driver an extra 80hp over a period of 6.67 seconds. Compared to the alternative of electrical-battery systems, the mechanical KERS system provides a significantly more compact, efficient, lighter and environmentally-friendly solution. In 2009, F1 is introducing new rules that will lower the environmental impact of the sport. Part of this is to recover deceleration energy that can be stored for acceleration. Xtrac will exploit Torotrak’s full-toroidal traction drive technology, for use in kinetic energy recovery systems within the motorsport industry, to assist its customers in meeting these new obligations. Some of the new KERS systems under development will be mechanically based and will utilise a flywheel to recuperate,store and subsequently discharge a moving vehicle’s kinetic energy, which is otherwise wasted when the vehicle is decelerated. The kinetic energy is stored during a braking manoeuvre and is then released back into the driveline as the vehicle accelerates. The toroidal traction drive variator, being developed with Torotrak and using Torotrak’s patented technology, is a central element in these mechanical flywheel-variator KERS systems as it provides a continuously variable ratio connection between the flywheel and the vehicle driveline, via the vehicle’s gearbox. Torotrak has granted a licence to Xtrac to design, manufacture, assemble and distribute components or complete variator systems incorporating Torotrak’s technology to its F1 customers. The innovative combination of a Torotrak variator – providing mechanical efficiency that should be in excess of 90 per cent – with a flywheel of advanced construction, results in a highly efficient and compact energy storage system. Whilst Xtrac will supply variator units to its customers, the flywheels for these energy recovery systems are being developed separately by the Formula 1 teams themselves and their specialist suppliers. Torotrak will provide the control system expertise. The two companies consider that the system is applicable to other motor sports and everyday vehicles and see the potential for wider applications – particularly on high-performance road cars – as an aid to performance and also as a means of developing future vehicles with reduced CO2 emission levels. 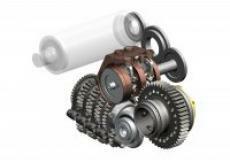 The system supports the current trend in powertrain design for engine downsizing by providing a means of boosting acceleration, overall performance and economy independently of the vehicle’s engine and without the need for complex electrical-battery hybrid architectures. A CVT-controlled flywheel is particularly suited to stop-start driving situations when real-world fuel economy is often at its worst. In these conditions, the variator-flywheel system can assist the launch of a vehicle which has slowed down or come to a standstill, by utilising the kinetic energy stored in the flywheel. In heavily congested traffic, where a car is frequently stopped and restarted, the system can help alleviate the heavy fuel consumption and emissions of greenhouse gasses normally associated with these conditions. For the F1 applications, the stored kinetic energy can be applied by the driver on demand whenever required – at a rate and for a time period set by the regulations – to boost performance for rapid acceleration. The device is particularly beneficial when exiting corners or for tricky overtaking manoeuvres. The components within each variator include an input disc and an opposing output disc. Each disc is formed so that the gap created between the discs is ‘doughnut’ shaped; that is, the toroidal surfaces on each disc form the toroidal cavity. Two or three rollers are located inside each toroidal cavity and are positioned so that the outer edge of each roller is in contact with the toroidal surfaces of the input disc and output disc. As the input disc rotates, power is transferred via the rollers to the output disc, which rotates in the opposite direction to the input disc. The angle of the roller determines the ratio of the Variator and therefore a change in the angle of the roller results in a change in the ratio. So, with the roller at a small radius (near the centre) on the input disc and at a large radius (near the edge) on the output disc the Variator produces a “low” ratio. Moving the roller across the discs to a large radius at the input disc and corresponding low radius at the output produces the “high” ratio and provides the full ratio sweep in asmooth, continuous manner. The transfer of power through the contacting surfaces of the discs and rollers takes place via a microscopic film of specially developed long-molecule traction fluid. This fluid separates the rolling surfaces of the discs and rollers at their contact points. The input and output discs are clamped together within each variator unit. The traction fluid in the contact points between the discs and rollers become highly viscous under this clamping pressure, increasing its ‘stickiness’ and creating an efficient mechanism for transferring power between the rotating discs and rollers. Surely Toyota’s F1 team will just use an electric motor/generator and a supercapacitor pack rather than a battery, and advertise that its (essentially) the same as what’s on a Prius. That’s got to be smarter than the bunch of unproven technologies in this flywheel-based system. Like where are toroidal CVTs being used? You have to wonder if Bernie has shares in Torotrak, which has spent millions on this technology, and hasn’t been able to get anyone to use it. gordon, i think you have to consider the rate of energy release. mechanical systems for this purpose would generally hare a quicker power output to the desired system (in this case the wheels). an electrical system would take time to convert kinetic energy to electrical and then back to kinetic. also electrical energystorage is very inefficient when compared to_mechanical energy storage. yes it may (currently) be unproven but i believe all it needs is some R&D & some elbow grease and this concept could change the way we see f1 and the automotive industry.